Store heat efficiently and use it economically. Empa storage tanks are designed to allow the boiler to run with fewer start-up and shutdown phases, which results in lower fuel consumption. KWB have a comprehensive range of hot water storage systems, with a solution for every situation. The KWB EmpaCompact is a ready-to-connect stratified storage tank. 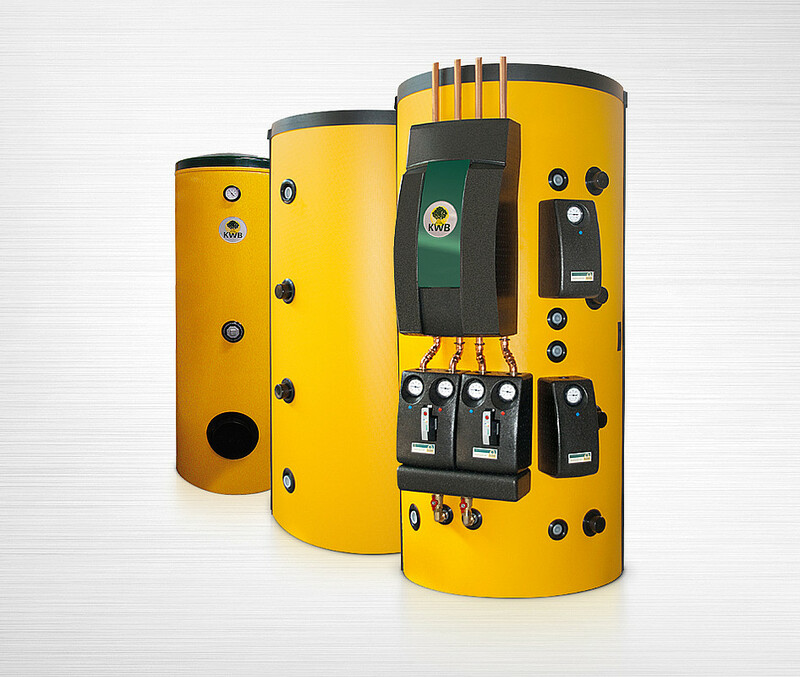 The system incorporates a buffer tank with a strata charging device, hygienic domestic hot water preparation, operation of low-temperature and high-temperature heating circuits, and charging of the storage tank with solar energy - all within one compact unit. As a result, its installation can be accommodated in a surface area of just 1 m². It is available in the following sizes: 825, 1000 and 1500 litres. The main job of the buffer tank is to compensate for fluctuations in temperature, as well as to supply heat when the heating system is shut down. The 'EmpaEco' buffer tank is the ideal companion to the KWB Classicfire log wood heating system, the Easyfire wood pellet heating system and the Multifire wood chip and wood pellet heating systems. If you want to integrate a solar system, you could opt for the 'EmpaEco Solar' buffer tank. The solar heat is transferred to the buffer tank water via a bare-tube heat exchanger. The EmpaEco is available in the following sizes: 800, 825, 1000 and 1500 litres. The Empa Eco Solar is available in the following sizes: 1000 and 1500 litres. The 'EmpaTherm' is a Domestic Hot Water Coil, used to heat up water in the water storage tank. The 'EmpaTherm Solar' has been specially designed for the combination of solar systems and biomass heating systems. Since biomass heating systems have longer start-up times in comparison to fossil-fuel heating systems, the heating register was put further down into the lower part of the storage tank for this system, so that more domestic water can be heated by the biomass heating system. Available in two sizes: 300 and 500 litres.